John Earl Stark had a problem. If his book sales didn't pick up, he'd have to go get a real job. So he called an old friend, a fellow author just returned from a "digital rehab" and wanting to get back into the swing of writing. Their styles and approaches were completely different. And each had nothing to lose by comparing notes with the other. Both of them needed a re-start at their "writing life". Of course, this was in between John's playing amateur sleuth for his very feminine spirit-guides, and goddesses. But his friend brought a couple of six-packs of "near-beer" so they could relax at John's cabins and just open up about what did and didn't work. This is the beginning of their long discussions about how to write fiction and make a living at it - or at least enough to enjoy a good life pecking at the keyboard.... The First Four Rules - Exceprt: **Recently, I had an author return to my stable after a short dint in a "digital rehab". ** He was a bit more gaunt, a bit hollow-eyed, but calmer. He seemed to have lost a nervous "edge" that he'd always carried around - along with a sharply barbed wit that had a hair trigger. His name is R. L. Saunders. Perhaps you've read some of his books. Maybe not. He said he was back and he wanted to get back into writing. We both knew it wasn't going to be easy. That "addiction" he went off to cure was also his crutch - the one he leaned on to write his satire and parodies. So I gave him a job. We had a bunch of works around that needed to be polished up and re-cataloged and so forth. I figured that by having to read our other author's works, maybe their style and approach would rub off on him. Maybe he'd be able to get some inspiration from their stories to build some new ones of his own. He gave me a weak smile, a nod, and then found himself a desk in one of the back rooms. 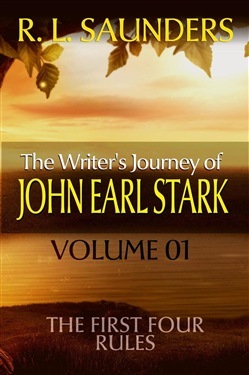 Not too soon after, I got a note from one of my other authors, name of John Earl Stark. He asked if I knew any one to recommend - that could help him with his flagging sales. A light bulb went off right then. I called up Saunders and told him that he needed to go out to interview this Stark fellow, that I'd be shipping a care package of materials out there with instructions on how to use them. Of course, I had to "loan" Saunders gas money to make the trip, and the use of my "Triple A" card in case his "beater" truck didn't make it all the way. Saunders was to write me a letter every week on their progress. And I sent an email to Stark saying that I was sending someone out - he just had to put the guy up and keep him fed. By the time Stark replied, Saunders was well on his way. Just yesterday, I got his the first report back. Here it is... Scroll Up and Get Your Copy Now. Acquista The Writer's Journey of John Earl Stark 01 in Epub: dopo aver letto l’ebook The Writer's Journey of John Earl Stark 01 di R. L. Saunders ti invitiamo a lasciarci una Recensione qui sotto: sarà utile agli utenti che non abbiano ancora letto questo libro e che vogliano avere delle opinioni altrui. L’opinione su di un libro è molto soggettiva e per questo leggere eventuali recensioni negative non ci dovrà frenare dall’acquisto, anzi dovrà spingerci ad acquistare il libro in fretta per poter dire la nostra ed eventualmente smentire quanto commentato da altri, contribuendo ad arricchire più possibile i commenti e dare sempre più spunti di confronto al pubblico online.